I’m always reluctant to talk much about CHARLIE AND THE CHOCOLATE FACTORY, because I never know what’s been approved by the studio for public release, and what’s supposed to be kept secret. But since this item showed up in Variety this week, I’m probably in clear mentioning that Freddie Highmore has been cast as Charlie. Who the hell is Freddie Highmore? Never met him. I saw his screen test, and he was great. 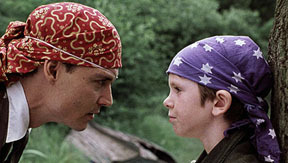 Tim likes him; Johnny Depp is already in a movie with him (J.M. Barrie’s Neverland); the kid looks properly hungry and Dickensian. So cheers all around. The movie starts shooting this summer at Pinewood Studios outside London.